Our Founder and President, Gerry Lagace, was impelled, as a member of the Old Fiddlers Club of Rhode Island, to start a fiddlers club in Connecticut. And so, on December 10, 1972, Gerry invited twelve local musicians to his folk’s home in Bristol to tell them how the Rhode Island fiddlers were active in playing their fiddles and promoting the “art” of “old tyme fiddling”. After hearing Gerry’s idea, these musicians wanted to persuade other fiddlers in the area, to take their fiddles out of their cases, rosin up their bows, and make them useful again. Thus was the beginning of the Connecticut’s Bristol Old Tyme Fiddlers Club! We are a non profit 501(c)(3) organization. Our purpose is to preserve and promote the art of the old tyme fiddling that has been passed down from generation to generation by ear. The old New England Fiddle Band style of group playing by ear is what makes our club unique. Our first appearance was in the 1973 Bristol Mum Parade. We’ve performed in Rockwell and Page Parks for the City of Bristol and the Bristol Boys Club O. M. Show. You can see us at country fairs throughout the state, perfoming on town greens and American Legion, Elks, VFW, Knights of Columbus and Masonic lodges. We’ve entertained at Senior Centers and Retirement Complexes, Medical and Alzheimer Centers, Nursing Care Facilities, Special Olympic activities, church functions, private parties and outings. We’ve performed for the Rhinebeck NY Duchess County Fair, Schenectady Niskayuna Folk Festival and as far as Madawaska, Maine. We have about 75 members, whose age ranges from 12 to 92. Most of our members play the fiddle. 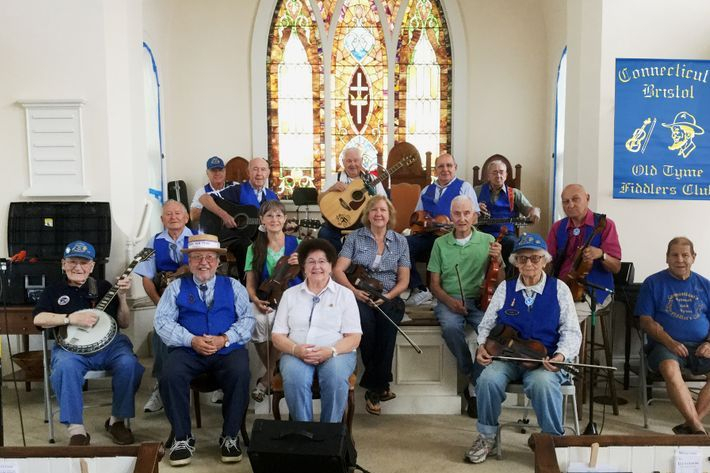 However, to accompany the fiddlers and add variety, we have musicians who play mandolin, guitar, bass, banjo, spoons, washtub, piano, button-box, harmonica, accordion, bones, jaw’s harp and percussion instruments with wood block. Our performances of one to three hours long include group playing and solos. Recordings are available on LP’s, Tape Cassettes & CD’s.